Since 1978, casino gaming in Atlantic City has created jobs – both direct and indirect – and has provided unequaled economic stimulus in our region. The gaming industry remains the largest employer in Southern New Jersey. Over the past 38 years, casinos have paid close to $13 billion in taxes and fees (not including property taxes), including $9.7 billion which was deposited into the Casino Revenue Fund. This money is appropriated exclusively for reductions in property taxes, rentals and utilities and for other services that support seniors and disabled citizens. Currently, the gaming industry directly employs close to 24,000 people, 97% of whom live in the seven southern counties, pays $590 million in wages annually, pays $136.7 million in taxes and fees and spends $680 million on purchases from vendors located in Southern New Jersey annually. The gaming industry has stabilized in Atlantic City – net gaming revenue is up and profits are about five times higher than they were in 2013. In 2015, Atlantic City casino operating profits were over 100% higher than they were in 2014. Casinos are investing in their properties, including in non-gaming amenities: dining options, conference space, outdoor and other entertainment offerings that attract high end acts, meeting space, and luxury suites. There are over 23 million visitors annually to Atlantic City who frequent both casinos and non-gaming tourist attractions. Atlantic City is the third largest mid-Atlantic and northeast market in terms of convention space, behind New York City and Boston; and is in the top six in number of rooms, delegates, number of conventions and meetings. Convention and meeting business is strong–spending by meeting and convention attendees was $179 million in 2015, a 28% increase over 2012. From 2006 through the end of 2014, over 50,000 new slot machine and table games positions came online in the Mid-Atlantic and Northeast gaming market, causing market shocks and dislocations in Atlantic City, Connecticut and Delaware. Most of these new casinos were located in the heart of Atlantic City’s feeder markets in Pennsylvania (Harrah’s Chester, Sugarhouse, Sands Bethlehem, Mount Airy and Mohegan Sun Pocono), New York (Empire Casino in Yonkers and Resorts World Casino at Aqueduct) and in Maryland (Cordish Live and Horseshoe casinos near Baltimore and Hollywood Casino in Perryville). The loss of market share from these out-of-state feeder markets has made the North Jersey feeder market even more important to Atlantic City. The proliferation of these out-of-state casinos, along with the economic downturn that occurred in 2008 through 2010, caused Atlantic City’s gaming revenue to decline by over 50%, resulting in the closure of four of its twelve casinos, essentially “right sizing” the industry to the decreased demand for gaming. $1.4 billion decrease in vendor sales. More than 15,000 jobs lost. High foreclosure rates and declining property values throughout Atlantic County communities that had grown to meet the housing needs of those working in the casinos and related industries. In fact, Atlantic County now has one of the highest foreclosure rates in the country, and is four times the national average. Unemployment rates in Atlantic County, Cape May and Cumberland Counties are the highest in the State. 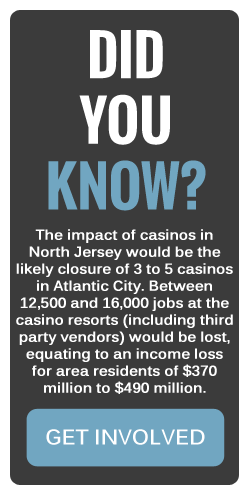 While the Atlantic City casino industry has finally stabilized, adding casinos anywhere in North Jersey will have a significant negative impact on Atlantic City and the South Jersey region. This is due to the fact that North Jersey is now a much more significant Atlantic City feeder market with a high concentration of Atlantic City gamers. Research shows that the gaming market in the Mid-Atlantic region is mature and therefore will not support expansion beyond those out-of-state projects which are currently planned. What will happen if two new casinos open in our state? 3 -5 casinos in Atlantic City will close. Gaming revenue will decline by $691 million to $1.4 billion. The region will experience total job losses ranging from 23,000 to 30,000 and regional unemployment rates will increase by 25% to 30%. Foreclosure rates, already among the highest in the nation, will significantly increase. The regional and state economic output will decrease by $1.5 billion to $2.0 billion. New Jersey State transitional and school subsidies to municipalities and school districts will potentially increase by $134 million to $367 million. Atlantic City Expressway tolls will decrease by $11 million to $15 million. State tax payments by Atlantic City casinos will be reduced by $86 million to $111 million. Spending at Boardwalk based small businesses will be reduced by as much as $100 million. There are several fundamental misconceptions about Atlantic City. Among these are that the casino industry is going out of business. This could not be further from the truth. Since the closure of four casinos in 2014, the casino industry has “right sized” itself. Industry profits in terms of Earnings Before Interest, Taxes, Depreciation and Amortization (EBITDA) more than doubled in 2015 to their highest total since 2009. The eight casinos that remain in Atlantic City have stabilized and are poised for growth. History has shown that the right kind of investment in Atlantic City leads to profitability and a sustainable gaming industry. In response to the onslaught of additional out-of-state gaming capacity in the northeast, several Atlantic City casinos including, Resorts, Borgata, Harrah’s, Tropicana, the Golden Nugget, Caesars and Bally’s have all invested in strategic improvements such as new restaurants, nightclubs, room refurbishments, convention facilities, concept dining and entertainment, and exterior improvements, resulting in all of these casinos thriving. These casinos continue to operate and are stronger than they have been for years. The industry is in a position to weather any remaining out-of-state expansion because, aside from one casino in Philadelphia, all of the new gaming facilities coming online in the next few years are in areas well beyond Atlantic City’s key feeder markets. Without two new casinos in northern New Jersey, the casinos in Atlantic City will continue to invest in their properties, enhance their offerings and leverage the critical mass of eight casinos in one confined area. Combined with the already existing non-gaming amenities in the City such as the Tanger Outlets, the Playground and other planned entertainment investments Atlantic City will regain its stature as the jewel of the eastern seaboard and one of New Jersey’s finest and most important assets. The expansion of gaming to northern New Jersey will add to New Jersey’s inventory of broken cities and instead of gaining a jewel and an asset, the state will be left with a broken city and region. VOTE NO ON NORTH JERSEY CASINOS!